The results from the National Student Survey (NSS) this year revealed that the number of students satisfied with Durham University dropped by 5%. With drops in every University-related question, Durham has landed below the national average on all but two questions. The NSS is completed by final-year undergraduate students shortly before they graduate. It asks students to reflect on their time at University and give feedback on the quality of their educational experience. The survey is not without its flaws, which are worth reading about here and bearing in mind when considering the results. However, the results do offer us a snapshot of students’ general attitudes towards the education experience the University offers them. While keeping my ear to the ground and listening to the concerns raised with me must always be my priority, the data can provide an additional supporting tool in convincing the University of the need for the significant and lasting change we all see as necessary. 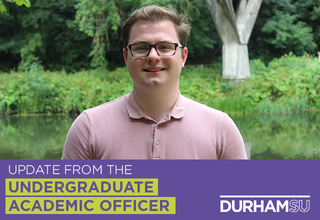 This year, through my position as Undergraduate Academic Officer I want to guarantee that Durham University has clear plans to improve the student experience and fight for improved provisions in what we know to be problem areas. To achieve this, we will work to empower students as active partners in their education rather than passive consumers. Looking back on the previous academic year, a few examples of why students may have been dissatisfied with the University stand out, many of which are the result of the rapid expansion of student numbers. I’m sure we all remember the 8am lecture fiasco and are aware of the increasing need for more learning space. Similarly, the clamour for space to study at exam times is something we’ve all seen, and know has been getting worse. We need to ensure that the University’s expansion does not come at the expense of student needs, academically and more widely. I believe we should also be able to see the strengths of Durham culture coming through in our student satisfaction with their education – but we’re not. Our proudly collegiate University, where our fantastic college communities are considered one of the best parts of the University experience, is a university where fewer finalists feel like they’re part of a learning community than the national average, and it’s on the decline. Durham finalists felt less like they were part of a learning community of staff and students, with the right opportunities to work with others, than students at any other university in the North-East. Learning communities are groups, spaces and projects that allow us to connect with staff and other students and engage with academic and professional ideas to improve our learning, and that they should be excellent here in Durham. If Durham University’s communities are what make us unique, then we should expect that we will also be part of communities that benefit our education and our academic learning. I hope that Durham’s brilliant academic societies – sources of support, connections to departments, places to meet course mates and to further academic interests – can help address this weakness. As an SU we are putting our efforts into supporting these groups and making them more accessible, and I can’t wait to drive forward that work as an Officer this year. We’re also able to train and inform your course reps, ensuring they are ready and able to lobby departments for improvement in areas that are clearly lacking. Course reps are there to represent you at the closest possible level and it’s right that they have the preparation to fight for your interests. Our fundamental aim at the Union is to make sure every student has the power and opportunity to transform their time at Durham. While Durham SU’s own score with regards to our representation of academic interests was slightly up from last year (the only positive movement on Durham’s balance sheet), we know there is work we need to do in this area and we have the plan to do it. We look a bit different than last year and the change in appearance also comes with an ambitious and student focused strategy for the next four years. Part of this plan is to ensure that all students in Durham have the power to transform their education, and I am looking forward to working alongside you to achieve this. But while we’ll do our utmost to represent you and ensure that every student gets the education they deserve, it’s crucial that the University upholds their part of the bargain. What we ask of the university is that they are proactive in engaging students with all parts of their education. With extended lecturing hours becoming increasingly part of the national debate, it’s critical that students are consulted before these problems arise so we can avoid a repeat of the mess we experienced this past summer. The delays to the library refurbishment will massively impact on students’ ability to study in an environment that matches their needs. We need a commitment to ensuring that sufficient study space will be delivered in the future, with fail safes in place so that no student is left fighting for space when they want to study in peace. Furthermore, with curriculum reform impending, student demands for a diverse and liberated curriculum must be heard and I’ll be dedicating much of my work this year to making sure we have an engaging, challenging curriculum that meets the needs of Durham’s diverse student body.